Many of you may know I signed a contract for my second book. The publishing company even asked for the right of first refusal for my third book, which is at the same exciting (Yay! A third book!) and horrifying (What?! A third book?). The working title of this book is Horses Speak of God, about the vocabulary of faith I've experienced in my years of riding horses and the particular way they've taught me about God. Writing is a lonely business. Most writers I know sit for hours in front of a computer screen. Alone. And write. On some days the 2500 words I write will all be worth keeping. On some very rare days. Most days, of 2500 words, maybe half will become part of the final manuscript. Maybe. The words I write plumb depths of my soul. My guess is most writers experience this. As we write and rewrite and rewrite, we shape our experiences so others can find meaning in what we lived through. We wonder if what we've brought up to the surface needs to be shared with anyone other that our therapists. Some does. Some doesn't. We put our selves and souls on the page in a particular way, and we are very thankful for editors. I write in the genre of faith memoir, which seems like it's own strange 12 step meeting at times. 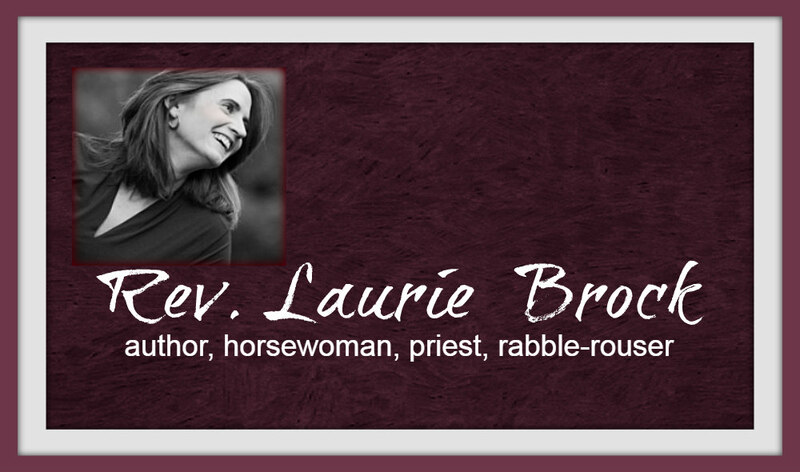 Hi, I'm Laurie, and let me tell you of my epic failures and how I experienced God through them. Somewhere I stumbled across a quote. "I don't like writing; I like having written." That sums up many writers I know. The process is hard. It demands our attention and does not play well with others. When I'm in the midst of writing a book, my social life decreases greatly because time each day goes to words written for an audience I can only imagine. The rest of the time goes to the church where I'm the priest and to riding horses. So in case you're wondering where the blog posts are, they will be a bit less frequent for a few months, but still here. I'll probably repost a few favorite posts from years past. Soon there will be a brand new book, a part of my self and soul shared with (hopefully) many, many people. And even a book tour, which is where I get to reclaim the social life. Now I am writing. Soon I will enjoy having written. Soon Nina is sure she will be famous. Legit LOL as I read, "Hi, I'm Laurie, and let me tell you of my epic failures and how I experience God through them." And then, after the initial laugh, realized that you've provided perfect editorial guidance about "faith memoir" (and also "spiritual memoir"); soon to be posted someplace where I won't ignore it. Bathroom mirror? I'm with you in whimpering spirit and practical reality as I finish up a manuscript.